Sinusitis – a modular concept which includes a group of diseases of inflammatory or allergic nature, characterized by lesions of the sinuses. In the absence of adequate treatment, the disease can lead to complications. Some of them may threaten the patient’s life. Therefore, sinusitis is very important to timely diagnosis and treatment. One of the most affordable methods of diagnosis of sinusitis is an x-ray. It is widely used in almost all hospitals and private clinics. Properly conducted, it will not give less information than other, more sensitive diagnostic methods. On x-ray visible maxillary and frontal sinuses. ENT doctors often deal with their disorders, sinusitis and frontal sinusitis. If you take a image used the particular laying with your mouth open – you can see the sphenoid sinus. Normally, they have a thin wall with a clear, well-marked contours. On closer inspection you can see the outlines of the cells of the ethmoid sinus. To assess pneumatisation, the intensity of the shadows inside the sinus is compared with the intensity of the shadows inside of the eye socket. Normally, they should be the same. The development of acute and chronic sinusitis is accompanied by corresponding changes on x-ray. Occasionally chronic the process is purulent. proliferation – the rapid growth of cells, which when treated leads to tissue repair. It is the exudation plays a key role for the radiological diagnosis of acute sinusitis. Leaked from blood vessels, fluid accumulates in the sinus. It is not so well conducts x-rays as air. Therefore, x-ray, which is negative, the liquid looks lighter than air. Its upper edge is smooth, clear. Another name of this symptom is «milk glass». This is a pathognomonic sign of acute sinusitis, that is characteristic only for this disease. In addition, on x-ray well-marked swelling of the mucous membrane. This factor makes it difficult to breath and the outflow of liquid from the sinus. Purulent variant of chronic sinusitis. Most often it develops due to inadequate or incomplete treatment of acute process. The culprit of the disease – bacteria. Often, it is the primary process, but may be secondary when it stagnated in the sinuses the mucus is attached pathogenic flora. On x-ray it looks like the shading with horizontal top level. As a rule, traced the thickened mucosa. If the transition from mucous membrane to the edge of the bone is smooth, the disease is in the acute stage. If the boundary between the colonic mucosa and a thickened edge of the bone clear, then at the time of the study entered remission. Sometimes the bone wall, there is another path. By density, it differs from the mucous membrane, and bone. It’s the residual effects that remain from a previous episode of acute sinusitis. Hyperplastic sinusitis develops as a result of the duration of the current chronic process. The mucous membrane is thickened, the inlet of the sinus is narrowed. It is manifested by the permanent difficulty breathing. On x-ray of the sinus affected hyperplastic process, have a thick, well-marked mucous membrane. The inner edge of its uneven and wavy. Polypoid sinusitis is characterized by growth of polyps in the mucosa of the sinuses. It is formed after years of the process. Depending on the number of polyps, it can be single or multiple. 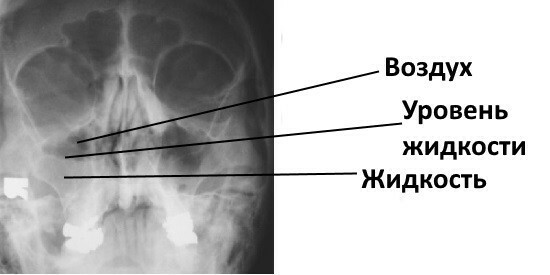 In the first case, on x-ray visible rounded shadow. They have a smooth top edge and are on the thin legs. If spines several, shadows can be layered on top of each other. The second option in the picture noticeable a massive shadow, often completely filling the sinus. Atrophic variant is characterized by degenerative changes in the glands of the mucosa. Characterized by scanty secretions with an unpleasant odor. On x-ray – thinned mucous membrane. From other types of sinusitis and is most often posttraumatic and cystic. the displacement of separate walls or portions thereof. Cause of cystic process is a cyst – a benign cavitary formation containing liquid. In the picture it has a round formation with dark content. 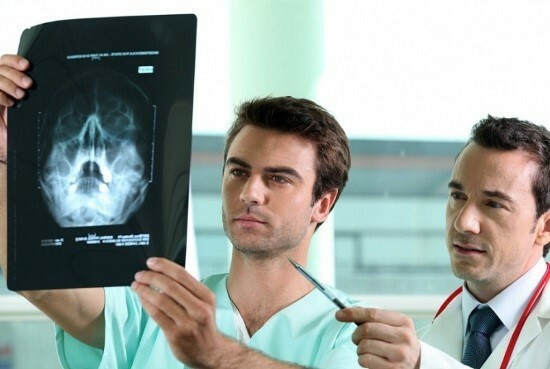 A full assessment of radiographs in sinus can only be done by a radiologist. It assesses all its performance in complex, taking into account the clinical picture and the data of other methods of examination.